On the holiest of India’s rivers, Varanasi is the holiest of cites. This town on the Ganges River in the northern state of Uttar Pradesh is one of the oldest continually inhabited cities in human history, and a place of deep significance to the millions of Hindu pilgrims who visit each year. During daylight hours, Varanasi (also known as Benares and Kashi) is a chaotic and intoxicating destination awash with tourists, worshippers and locals going about their usual rituals. 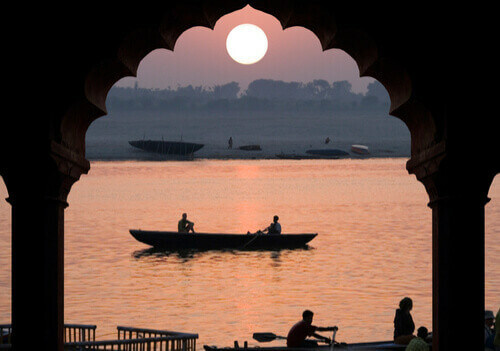 But a dawn boat excursion on the Ganges offers a more serene vantage point of this deeply spiritual place awaking for the day. 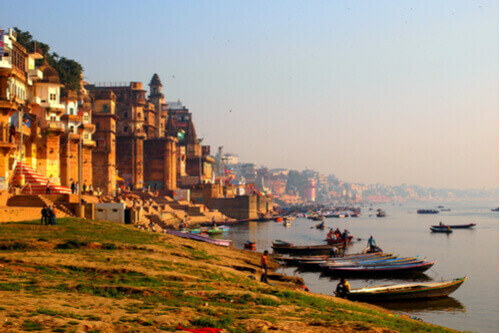 The Ganges is the lifeblood of Varanasi, and the ancient town revolves around it. Hindu devotees flock to the ghats (steps leading down to a river) along Varanasi’s waterfront to take ablutions, pray and, when the time comes, have their last burial rites on flaming pyres. 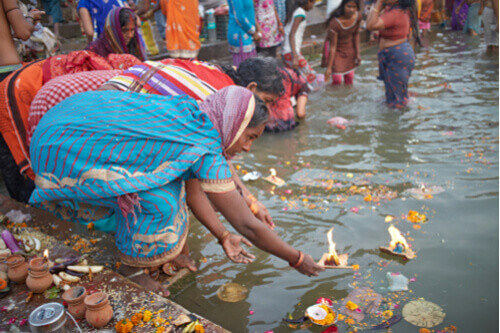 Many Hindus believe that to bathe in the Ganges at Varanasi washes away sin, and to be cremated or laid to rest there offers moksha – releasing the soul from the cycle of regeneration. The sick and elderly flock to Varanasi for their last days, and families come to commit loved one’s ashes to the water. Bearded and dreadlocked sadhu holy men smeared in ash from the funeral pyres are a common sight meditating on the ghats. For Hindu pilgrims, sunrise is the most fortuitous time to bathe in the Ganges, so a very early wake-up call is necessary to be out on the water before the devout arrive en masse. In the pre-dawn light the narrow, cobbled streets of old Varanasi are a maze filled with shopkeepers setting up for the day, cows and stray dogs, but on reaching the moorings the sluggish expanse of the Ganges emerges out of the gloom. Rickety rowboats and small motorized vessels wait to ferry visitors out onto the quiet water, where sunrise slowly illuminates the colourful jumble of buildings and ghats pressing up to the river. As the mist lifts off the river, the Muslim call to prayer drifts from Varanasi’s handful of mosques, and Hindu pilgrims start to flow onto the ghats. Boat tours float just offshore past the more than 80 ghats lining the waterfront, providing an intimate glimpse of locals doing their laundry in the Ganges’ waters and brightly dressed pilgrims splashing themselves and offering prayers to the rising sun. On the two funeral ghats of Harishchandra and Manikarnika, the ever-present funeral pyres smoulder on. By the time the sun has fully risen and it’s time to come ashore, Varanasi will have settled into its normal busy rhythms. Purchase an offering of flowers and a tea-candle from one of many vendors, and consign a little bit of yourself to the sacred waters before you depart.